The initial idea came from reading about the "remake Pong for the 20th anniversary" competition. I had an image of dribbling the ball along a curving ground. We never submitted the idea for the competition, the rewards didn't seem to be worth it. I didn't want to submit and get 6th or something, so not win anything but Atari has the rights to the idea! And eventually seeing the winners, ours would have been pretty far out there. I created the XCode project Feb 10, 2012. "SpringPong" was the initial placeholder name. We immediately decided it needed more than dribbling, and it became a mashup of Pong for bouncing, Tiny Wings for the curving ground, and Angry Birds for smashing stuff. It started by using ground Shawn had drawn for a yet-to-be completed game, and he did the smiling ball too. The initial theme was going to be "video game themed" and be inspired by all sorts of games thru history. The very first versions had basic little buildings, but we soon switched to the random stacks of blocks since there could be much more variety. Shawn did a few other things in this batch, and I did the minesweeper ones. Lots of Physics (thank you Box2d) so the boxes fell and bounced realistically. There's a big section about this time I missed taking screenshots while we tried many things that didn't survive long. A number of versions had you releasing balls from cages. We tried having them be copies of the original ball, but that got too busy--after a few balls were active, everything got smashed barely onto the screen, and it was very easy to keep at least one of the balls going. We did so the balls that were released had a powerup, like exploding any blocks they hit, and those colored balls shrank away after a 10 seconds or so. That got very busy too, and really didn't have a main character. No screenshots, but a video! With the Dillo armadillo character, and trying sections with a ceiling. Pete said something like "It's a great technology demo, but it has to be a game." Figuring out the Game part took a long time. Dillo Dreams. We worked quite a long time with this as the theme. Very meta, Dillo is dreaming he's the star of a video game. We'd done three pretty complete themes: iWorld, Jeweled, and Old School. You'd break the boxes to release stars, and catch them with the paddle. 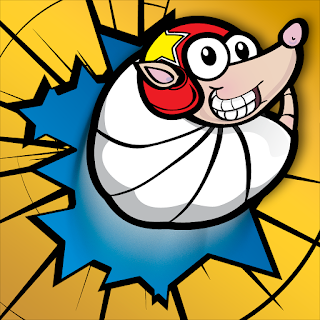 Breaking the boxes with a big star on it now released a big power-up star you could catch with the paddle and activate the power-up on Dillo. You could pick colors for the helmet and that gave extra time for the power-up of that color. Everything stacked up very precariously, so any tap would send the boxes falling. For a long time you just bounced along faster and faster, but at high speeds it was hard to see things collapse--you'd be past before they hit the ground. We added some "pauses" where it slowed down if Dillo was bouncing back toward the paddle, to give more time to see and smash stuff. You'd get more power-ups available the farther you went in one game. With some end-game bonus things so you'd restart at chapter 2 or 3 to let you get a bit farther in later games. A ceiling, getting extra meta video-game-in-a-video-game with the iPhone status as the ceiling. We liked it, but hadn't really figured a good use; going in a cave or something was the best idea for how to drop the ceiling and have you bounce off that too. We showed it to some people at Chillingo as part of looking to see if we should work with a publisher....and they didn't like it. Really they were 100% right with the comments, so we owe them a huge thanks. It's going to be a better game because of them. It was too easy, and the difficulty didn't ramp up well. It was hard to aim and you could have bad luck with blocks getting in the way right in front of the paddle. A good player and a bad player would get similar scores on the same section; there wasn't a level of player expertise beyond not missing. And they didn't really like the armadillo character and video gamey theme. We tried and rejected some sort of swipe control to aim and shoot him. One big hangup with this desert theme was we never could think of what would explain the paddle. Bouncing off a bed? Tumbleweed? Something else? Somehow you'd have to keep ahead of the tornado--a bit we didn't ever figure out before changing. Between August and November 2012, we worked quite a lot and had some totally new ideas that took the game in a very different direction. The resulting game is still in being completed and hopefully will come out sometime early in 2013. I'll post this section of the progress once the other game is released! I wondered about doing both versions of the game, since we had so much of this game working too, so spent a bit of time revisiting the old ideas. And in the end, they're very different. People who have played both hardly even recognize that they're related. We made a few changes, and figured out solutions to a few of the gameplay holes on this 2nd time around. The other major solution we figured out was for "aimless bouncing". Because of the curving ground, the ball can just get bouncing up and down, or be too high and passing over the piles of blocks. A simple gameplay solution: a new tap action to call the ball to the paddle. So much easier than some technical fix we might never have found. And lets you as the player do cool back-side aiming to hit on the far side of towers, or retry to line up a shot on a block you want to hit. We thought up lots of fun and silly things for the random rainbow star. And in our constant re-use of things, the "Laser" is part of cannon muzzle flash Shawn had done for the Armadillo game. I stretched out a part of it to make a beam, and voila! Laser! Some of the better particle effects, nice outlines to go along with the outlined look of the paddle and ball. This has the new thermometer graphic for the bonus multiplier, and better buttons for pause and recall too. The blocks still can get in the way of the ball a bit, but not nearly as much with the much slower pauses at the towers. Rather than having all the powers (since it quickly got overwhelming when we were even testing) we decided to limit to 4, and a nice power selector to let you pick any of them to mix and match. Adds nice re-playability, to try different combinations as you get new powers. Bullet Blast was the last power, there was a blank hole in the grid for a long time. Adding lots of crazy things for the Random star is where the bullets started, and they turned out so cool it made sense to include them as the final destructive power you unlock. Simple menu, but lets you see your current powers, and makes PLAY the big obvious choice. 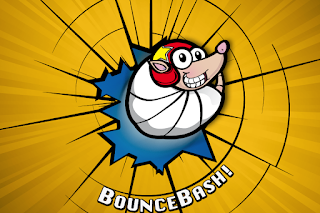 We had trouble figuring out the name, finally coming up with BounceBash. We'd always wanted Bounce in the name if we could, since that is the best one-word description of the gameplay :) Bash had the nice alliteration, fits under an icon, and has the nice double-meaning of "hit" and "party". We contacted Beatscribe who did some great music for the game, and most of the sound effects too. He loved the gameplay but didn't like the stark white graphics, so we went full circle and tried putting in the Armadillo again :) There were a lot of tries. For a few days it was the stark black/white graphics until you got a powerup, then the whole world changed to be in color and have the Dillo character. In the end we went with black and white versions of the nice drawn graphics, with those changing to color as you got a powerup. It helps show "we do have nice graphics, it's a style choice to be black and white" even at the beginning when you haven't seen a powerup yet! There were a few new things needed, but mostly we got to use all the things we'd done before, Sweet! Shawn drew a few new things for the ground for different powerups, like the Moonscape and the very last one to get done was the awesome Earthquake ground. Shawn drew smiles and grins for expressions on the guy, there's even a space helmet he wears on the moon! Pete used them to make the awesome icon with the "crazy-smile" grin. The main menu needed to be a bit cooler after the change from "starkness", so added the game terrain constantly scrolling past. There's an invisible thing behind the Y that starts everything moving and falling. It shows before you even begin a game that 1) we have nice graphics 2) things are going to fall and smash which is cool. We went back to the old ping-pong paddle as the main one. Thinking if we say "bounce with the paddle" it's as obvious as we can make it what you use to bounce with. We really did get to use nearly everything. 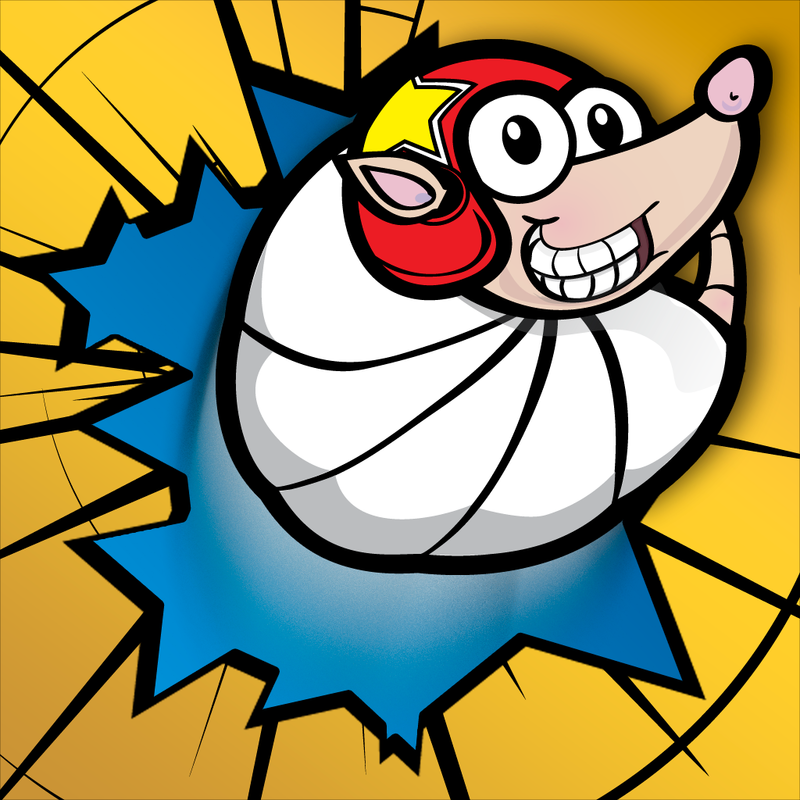 The old gem theme from the Dillo Dreams days, plus a new gem ground and paddle that Pete made work perfectly for the highest triple-stars and triple-points powers. I spent a long time working on the help and tutorials. This is I think the 3rd version of what you'd get from the HELP button on the main menu. Little bits of animation, and lots of small tweaks to the wording as I showed people at the Seattle NSCoder Night group. "Slide and Bounce" changed to "Slide On The Left And Bounce" and also added the finger on the left. WHEN to use the recall wasn't as obvious in early help pages and confused testers. This is a good change to the text and animation that came from the NSCoder meetings. It animates a tap and him flying backward thru the blocks--as you can see in the final game. Pete made the great icon and splash screen, as well as the trailer video. And after all that, months of work and changes and testing, we submitted it December 7, 2012. We all clinked drinks against the Skype window on our computers for a toast. And finally, December 18, it got approved by Apple. 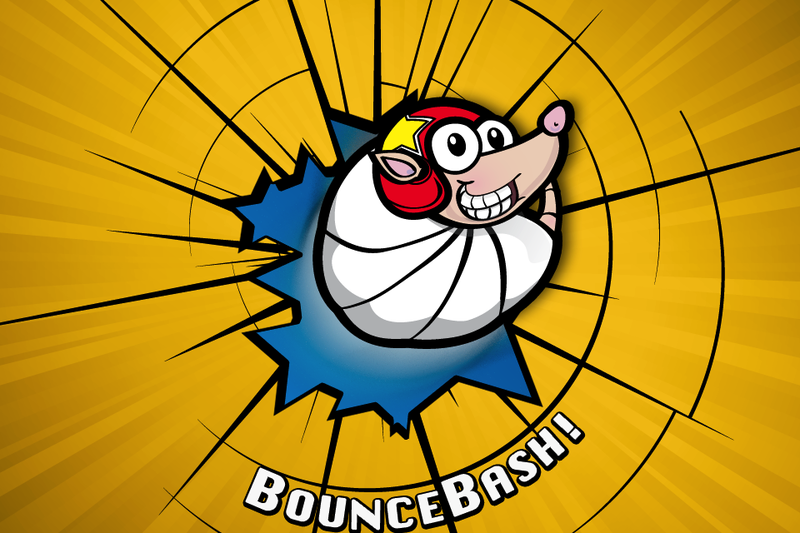 BounceBash In The App Store!